If you use MyFantasyLeague.com (MFL) as your league management website, you can download your league settings and/or upload your draft results in just a few clicks! 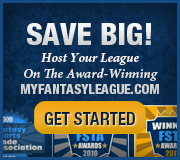 Thanks to our partnership with MyFantasyLeague.com, MFL is offering a $20 discount on the MFL service (applies to new MFL customers only). If you have prepared your MFL league prior to the draft, you can download your league settings and quickly create a new draft using those settings. To load your completed draft results into your prepared MFL league, simply click the "Share/Export..." button and then click the "Export to MFL" button. Enter your MFL login information in the browser window that appears and click the "Upload to MFL" button. It's that easy!